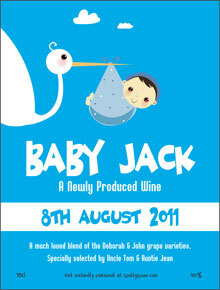 A Funny & Sweet Wine Label for a New Baby. 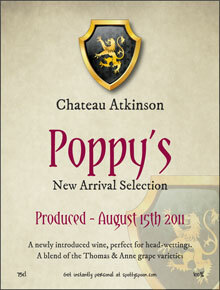 Welcome the new arrival with a personalised bottle marking the date. Will reach its full maturity in the year 2037! Create a funny and delightful gift for a couple who have just had their first child. This personalisable wine bottle design will enable you to make an unusual and affordable gift which they will treasure for years. 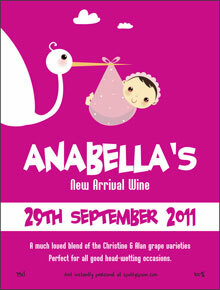 With the baby's name as the main wine title along with the DOB and the parent's names, it marks the new arrival's birth in a very memorable way. Add phrases to make this gift a bit different eg. 'A very young wine which is sure to develop perfectly', 'Best enjoyed late at night after baby's bedtime', 'Serve with a good cigar', 'Will reach its full maturity in 18 years!' etc.